This week’s question comes from Stuart, a client who would like more information about the current bond market environment and the recent increase in interest rates. Q. What is going on with the bond market and why are interest rates going up? A. Thanks for your question, Stuart. The bond market is a somewhat complicated animal and there are many reasons why interest rates can move higher. Let’s focus on the 10-year U.S. Treasury yield as it’s one of the most widely followed measures on interest rates. The current yield on 10-Year U.S. debt is 2.1%, which is still very low by historical standards. The big hullabaloo in the news lately is in response to these rates moving higher just over the past few weeks from 1.7% to 2.1%, which is the highest level in a year for the 10-year bond. When interest rates move higher, the price of the underlying bond moves inversely, and therefore, the value of the bond declines. So, investors in bonds see a decline in their principal as interest rates move higher. All else equal, this is one reason investors would consider avoiding or underweight bonds that would be negatively affected by rising interest rates. Stocks can also be negatively impacted by a sharp increase in rates, especially in the short run. However, the forces pushing interest rates higher are typically positive economic developments, and therefore, will likely have a positive impact on future stock prices. There are several reasons for interest rates to move higher, some more ominous than others. We think the recent move is likely in response to some of the less sinister reasons. First, there could be some assumption that the Federal Reserve is going to scale back their programs designed to keep interest rates lower. One of the mandates of the Fed is to encourage full employment. According to the government and Gallup poll data, the unemployment rate has steadily moved lower from over 10% just a few years ago to less than 8% currently. As the unemployment rate moves closer to the Fed target of 6.5% you would expect interest rates to rise in anticipation of a less accommodative policy by the Federal Reserve. Another reason for interest rates to increase is general economic strengthening. Stock prices have reached all-time highs as corporate performance – namely, profits – improve. The housing market is strengthening as new homes are being built at higher annual rates. Moreover, housing prices have increased 10% over the past year compared to a year earlier. The March housing report indicated that this increase in prices was the largest gain for home prices since 2006. Consumer confidence reached its highest level since 2008, likely because of the improvement in stock prices, the improvement in the housing market, and an improving job market. The current economic conditions do not support the ultra-low interest rate environment you would expect to see during a recession or even a depression. Finally, interest rates can also increase when inflation is expected to increase. But with industrial capacity utilization still running below the long term average and unemployment still elevated, a surge in inflation doesn’t seem likely for the near term. In fact, the most recent reading of core price inflation shows a current inflation rate coming in at roughly 1%, well below the normal 2% or 3% expectation. While CNBC and some other media outlets have advertised this move as significant, a longer term review would indicate this recent increase to be a rather slight adjustment (albeit the recent uptick in rates occurred over a relatively short period of a month). We would expect rates to continue to move higher over the next few years especially if the economic data generally continues to improve. I hope the foregoing has given our readers some useful information regarding the bond market and interest rates. Please contact us if we can provide more guidance and evaluate your particular situation. In observance of Memorial Day, the offices of Rollins Financial and Rollins & Associates will be closed on Monday, May 27th. 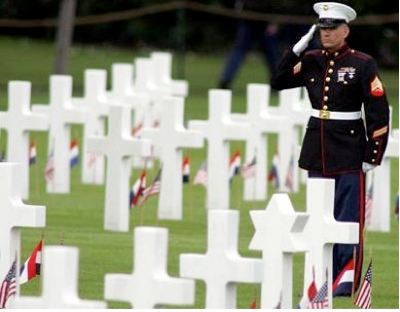 Please note that all major U.S. stock exchanges will also be closed in honor of those who died in service to our country. If you require immediate assistance on Monday, please contact Joe Rollins at 404.372.2861 or jrollins@rollinsfinancial.com. Our office will re-open for business on Tuesday, May 28th at 8:30 a.m. I can never pass up an opportunity to remind you how good the financial markets have been lately. For 2013 through May 20, 2013, the S&P 500 is up 17.8%. Whenever the market is up this much, I find myself worrying about clients who have money sitting in checking accounts. At the current time, most fixed-interest rate instruments are yielding a negative real rate of return. Investors who are keeping vast amounts of money in cash are actually losing purchasing power. I also think about investors who do not make their IRA contributions early in the year. With the S&P 500 up 17.8% so far in 2013, people who wait until the last minute to make their annual IRA contributions are missing out on a fabulous opportunity to generate higher returns. It’s still not too late to invest. Even though the market is up and setting records almost every day, investing in the stock market continues to be relatively cheap by historic standards. Simply put, equity investments are the best game in town. Most of my posts focus on mind-numbing economic facts and financial information, but I watched a documentary last night regarding World War II that I thought some of you might find interesting. I’ve always been a history buff and I enjoy learning new things, and this particular documentary presented information that I had not previously heard. I was watching the Braves game on TV last night, but I quickly lost interest in the game after they ran up the score fairly early. I switched over to the Military Channel and happened upon their two-part series on events that changed the history of the world. This particular episode focused on the dropping of the first atomic bomb during World War II. History and science are very interesting when looked at together, and the invention and evolution of the atomic bomb is no exception. One interesting fact that I did not know is that the atomic bomb that was dropped on Hiroshima on August 6, 1945 (“Little Boy”) had never even been tested. They had absolutely no idea whether the bomb would explode in the plane or if the plane would not be able to escape the violent blast. They were basically working on theories. I vividly remember growing up in the aftermath of World War II during the 1950s and hearing about the atomic bomb. With the Cold War in full force, the headlines warned of impending nuclear war, and in fact, I remember seeing the nuclear test explosions on the nightly news. I also vividly recall the push for families to build their own bomb shelters in the late 1950s, equipped with food, water and other types of rationings to allow you to survive an atomic bomb attack. 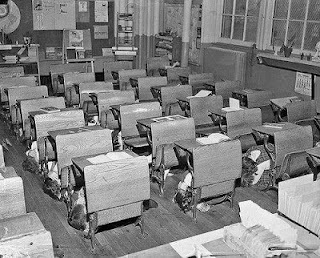 In school we practiced atomic bomb drills where we would hide under our desks – as if we actually would’ve avoided the devastating effects of an atomic bomb by hiding under a desk. What I found so interesting about the Military Channel’s documentary were the interviews of the principals involved in the Japan bombings. Colonel Paul Tibbets, the pilot of the Enola Gay (named after his mother), the first aircraft to drop an atomic bomb in the history of warfare, provided some very compelling food for thought. He was an interesting character, and he described how the plans to drop the atomic bomb had occurred over many months. In fact, he and other B-29 Superfortress Bombers had flown almost daily over mainland Japan, but since their planes were flying at over 30,000 feet, the Japanese tended to ignore them. They were just too high for any aircraft fire to reach and the Japanese Zeros were incapable of doing much damage to those types of planes. For months, the crew dropped practice missions against Japanese-held islands and mainland in preparation for the final run. 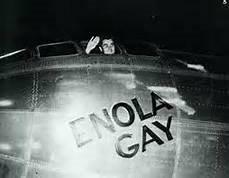 On August 6, 1945, the Enola Gay departed from Tinian, a remote island in the South Pacific. After a six-hour flight from the island, the crew was over the mainland of Japan, and exactly on schedule, dropped “Little Boy” over the city of Hiroshima. The bomb was designed to explode at exactly 1,968 feet off the ground, a mere 43 seconds after it left the plane. Due to the extraordinary explosion, the crew had only a short period of time to clear the area or expose themselves to the nuclear fallout. 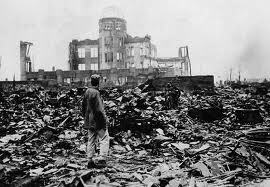 Obviously, the bomb caused enormous destruction, destroying nearly 4.7 square miles of the Hiroshima city and causing approximately 70,000 to 80,000 people – about 30% of the city’s population – to perish. Of course, the death toll is higher due to radiation poisoning that occurred over the years as result of the explosion. Undeniably, the bombing of Hiroshima and Nagasaki on August 9, 1945 brought a swift and complete end to World War II. Colonel Tibbets was a national hero that was held in high esteem by the military for his part in this mission, but he was controversial because of his role in the destruction caused by the bombing. He explained in the documentary that many history teachers do not seem to understand WWII, and he reflected on a speech he was giving to a high school audience where he was introduced as the pilot in “World War Eleven.” However, he expressed no regrets in bombing Hiroshima since the Japanese government was routinely killing his friends and comrades in the military, and whatever it took to end the war was acceptable to him. History teaches us many things, and while atomic energy is necessary and is the cleanest, most efficient type of energy available today, nuclear bombs for military purposes must never be used in the future. While this story has nothing to do with the stock market, it is a lesson well learned. On a personal note, congratulations are also in order to my son, Josh. He and his golf teammates at Woodward Academy won the Georgia High School Association state boys golf championship by four strokes at the difficult Reunion Country Club golf course in North Atlanta. Josh shot an outstanding 74 (two over par) at the tournament, which is even more impressive when you take into account that he triple-bogeyed a hole. In fact, five of the six players on Woodward’s team shot in the 70s at the tournament, a difficult feat that those of you who play golf understand. I’m very proud of Josh and his teammates’ accomplishment in winning this prestigious event. Q. I’m interested in donating to a Georgia Student Scholarship Organization. How does that work, and what are the tax advantages? Would my contribution cover any of my son’s private school tuition? A. This is a timely question, because Governor Deal recently signed House Bill 283, which includes important changes to the Qualified Education Expense Credit. There are a lot of taxpayers who could be positively impacted by this credit, so thanks for your inquiry. First, Student Scholarship Organizations (“SSOs”) were enacted by former Governor Sonny Perdue in 2008, to provide scholarships to independent K-12 student schools by using Georgia income tax credit-eligible charitable contributions. In short, taxpayers making donations to SSOs receive dollar-for-dollar income tax credits against their Georgia income taxes for their contribution. So, for example, if a married couple filing a joint return owes Georgia income taxes and makes a contribution to an SSO, it will reduce their Georgia income tax balance by the amount of the contribution, and they can also take a charitable donation deduction on their federal income tax return for their contribution amount if they itemize. That’s a pretty good deal, right? In general, the maximum amount a married couple filing jointly can donate to an SSO per tax year is $2,500 (the maximum for an individual is $1,000). And if an individual has paid all of his/her Georgia estimated taxes for a tax year and then makes an SSO contribution in the same tax year which results in an overpayment after applying the tax credit against the Georgia income tax due, then the overpayment can be paid to the taxpayer. Also, for individual taxpayers, the credit may not exceed the taxpayer’s income tax liability, but the amount of the excess credit amount can be used against the taxpayer’s tax liability for the next succeeding five years. Unfortunately, prior to HB 283, the only corporation type that was eligible to receive a tax credit for amounts contributed to an SSO, up to 75% of their income tax liability, were C corporations. Unfortunately, members of LLCs, shareholders of S corporations, and partners in partnerships were precluded from counterbalancing their share of the entity’s income by claiming the credit. The passing of HB 283 has changed those rules, and now owners of pass through entities may claim a credit up to $10,000 per tax year. Spouses may also claim a credit for their ownership interests, which means they are separately eligible for the credit if they file a joint return. Please note, however, that the tax credits are only allowed on the Georgia income for which such tax was actually paid by the owner of the entity. In the foregoing scenario, the total credit allowed can’t exceed $10,000, even if the taxpayer is an owner of more than one pass through entity. Therefore, the taxpayer must decide which pass through entities to include when computing Georgia income for the purposes of this credit. All Georgia income, loss, and expense from the selected pass-through entities are combined to determine Georgia income for the credit, which is then multiplied by 6% (Georgia’s tax rate) to determine the tax that was actually paid. In this case, if a credit is more than a taxpayer can use in the year, the excess amount can’t be carried forward. It’s also important to note that if you are a member of an LLC, S corporation or partnership owner and you’ve already made an SSO contribution under the terms of the old bill (i.e., $2,500 or $1,000), you can still apply right now to make a donation for the difference under the changes pursuant to HB 283. Part of HB 283 increased the Qualified Education Expense Credit Cap for 2013 to $58 million. Amounts are allowed on a first-come, first-served basis, and once that cap has been reached, there will be no more credits available for the 2013 tax year. If you are interested in contributing to an SSO for 2013, you need to do so ASAP – 75% of the $58 million cap for calendar year 2013 has already been preapproved. The first step in contributing to an SSO is to check with the school of your choice to see if it is a participating school and if it partners with a particular SSO. Most SSOs provide a paperless process for redirecting your tax dollars to the institution. Alternatively, you can apply for the income tax credit for qualified education expenses on your own by completing and filing a Qualified Education Expense Credit Preapproval Form, which is used to request preapproval of an intended contribution to an SSO. The Georgia Department of Revenue has 30 days to either preapprove or deny the requested amount, and once preapproval is received, the taxpayer has 60 days from the date of the preapproval notice – and within the calendar year in which it was approved – to make their contribution to their designated SSO. Consistent with the federal treatment of charitable donations, a contribution to an SSO can’t be directly or indirectly designated for a particular individual – whether or not such individual is a dependent of the taxpayer. As such, contributions to SSOs are not payments toward your child’s private school tuition. Although you can’t designate a particular individual for your contribution, you can designate that it be used to provide scholarships to students of a particular school (or multiple schools). You can click here for a list of Georgia SSOs from the Georgia Department of Education. Note that an SSO may support several different participating schools. I hope the foregoing has given our readers some useful information regarding Georgia Qualified Education Expense Tax Credit. These credits are useful tools in providing significant tax savings to taxpayers which ultimately provide scholarships or tuition grants that allow students to attend any qualified K-12 private school. Of course, this is a very complicated matter, so please contact us if we can provide more guidance and evaluate your particular situation. UNDERSTANDING THE WEALTH EFFECT AND WHY THE GOVERNMENT WANTS YOU TO FEEL IT. In case you hadn’t noticed, the U.S. government is doing everything within its power to help you personally feel the wealth effect. There’s never been such a concentrated effort by our government to make the average American feel wealthier than they were last year. There’s a complete and total full-court press on increasing the net worth of American taxpayers, so you may as well enjoy it! In the last 30 days, the rest of the world has gotten on the bandwagon. Japan is flooding its economy with money, and even European countries have cut interest rates and increased liquidity. There’s a very important reason all of these actions have been taken by these governments, as I will later explain. April was another excellent month for investing, and for the first four months of 2013, investors couldn’t have experienced a better investing environment. After six months of great investing, I wonder about those clients with cash sitting in money market accounts earning practically nothing. Over the last six months, the S&P 500 is up 13.13%, and money sitting in cash has earned ZERO. There are also so many people who refuse to contribute to their IRAs early in the year and prefer to keep money in non-interest bearing checking accounts. The last six months have certainly proven that strategy to be wrong. Interestingly, for the month of April, the S&P 500, the NASDAQ and the DJIA all had an impressive total gain of 1.9%. Not only was it an excellent month, it was also unusual in that all levels of stock ownership gained exactly the same amount during the month. April’s performance is a continuation of the excellent returns we’ve had thus far in 2013. 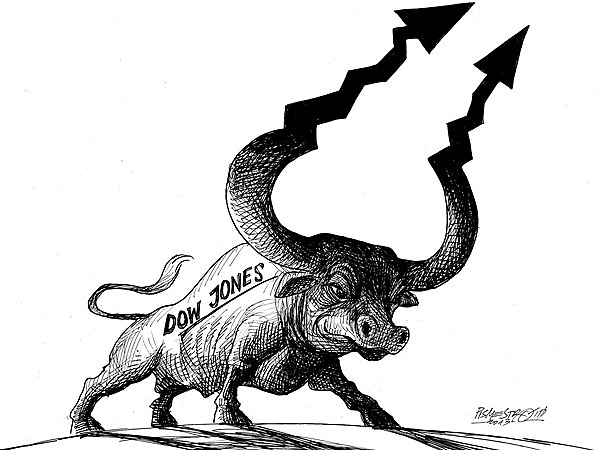 For the four months ended April 30, 2013, the S&P is up 12.7%, the NASDAQ is up 10.6%, and the DJIA is up 14.1%. Even the smaller and more volatile small cap Russell 2000 index has had an excellent return thus far for 2013 of 12%. All of these excellent returns likely prove for most investors that regardless of where you invested in the market during the first four months of 2013, you made an excellent rate of return. It also points out that if you hadn’t been invested, you would’ve earned nothing. This very important point is the basis for which I am explaining the wealth effect and why the government wants you to enjoy it. Off and on since 2008, the Federal Reserve has been flooding the U.S. economy with excess liquidity. This excess liquidity is designed to inflate asset basis so that Americans can enjoy the wealth effect. The wealth effect has an enormous number of positive attributes to the U.S. government, and therefore, that’s the specific reason they want you to enjoy it. We actually see the wealth effect at Rollins Financial up close and personal. It is amazing how often we receive phone calls from clients expressing their opinion that since the market is up, they would like to take money out of their investments to spend before it goes down. While on the surface that seems like a strange approach, it’s exactly what the government is trying to get you to do. Money withdrawn from investments is usually spent on consumer goods – things like vacations, house repairs, and purchases of vehicles or other items – all of which create additional commerce. This contrasts directly to time periods when the stock markets are down. After the markets have been selling at discounted values, we almost never hear of anyone wanting to withdraw money from their investments for consumer goods. At that point, investors sit tight and let their investments recover. A similar concentrated effort is now working in the real estate market. With interest rates approaching zero, the government is making the ability to purchase homes available to most anyone with a good credit rating – and that’s working!! For the first time in several years, real estate prices are starting to appreciate. In many cities, there’s actually demand far in excess of the supply of homes available for sale. There are two reasons for this shortage of houses: (1) existing homeowners are refusing to sell, either because they think there house is worth more or they are underwater and cannot sell without paying at closing, and (2) virtually no one is financing spec homes, so builders are precluded from building until they find a buyer willing to close the transaction. The effect of the foregoing is that real estate values are going up. We all know from prior experience that as values go up, investors tend to use their homes as piggybanks; they will take out equity loans and repair the house, build a pool, or purchase a car. Each and every one of these events creates additional commerce and increases GDP, which the government desperately wants to happen. The most important reason the government wants to create the wealth effect is that it creates an enormous amount of income taxes when wealth is traded in. For example, when you withdraw money from your investments – either from an IRA or to sell for a capital gain – income taxes are created, which funds the U.S. government. It’s no coincidence that the administration massively increased income taxes on capital gains for 2013 in full contemplation that gains would be realized with the upward movement of the stock market. Therefore, the wealth effect has many positive attributes: it creates a confidence level with consumers so they can spend more money; it creates commerce by encouraging homeowners to repair and build new homes; and it increases the value of real estate. Most importantly, however, it creates income taxes to fund the huge and unsustainable deficits created by our government. As April showers turn to May flowers, the media is in a feeding frenzy regarding the old Wall Street axiom, “Sell in May and go away.” Every time that’s said, I always wonder where it is we should be going. Cash is currently earning nothing, a five-year CD pays below the rate of inflation (creating negative wealth), and bonds may be attractive, but they have a bigger risk factor than stocks with the increase in interest rates in the coming years. Anyone buying a 10-year Treasury bond at a current rate of 1.7% would essentially lock-in losses for the next decade. Since the other investment alternatives are virtually non-existent, I always wonder about the value of moving money to the sidelines when the potential for gains continues to exist going forward. The GDP for the 1st quarter of 2013 was at 2.5%. While this isn’t sterling, it is an improvement over the 4th quarter of 2012. One of the advantages of the GDP being muted is that the Federal Reserve is unlikely to do anything with GDP being as anemic as it is and unemployment still sky high. As long as there continues to be a question about GDP and unemployment levels, there is no chance that the Fed will withdraw its stimulus from the economy. This morning, the Department of Labor announced that the U.S. economy added 165,000 during the month of April. In addition, they announced surprising revisions to the two prior months, adding another 114,000 jobs. These aren’t blowout numbers, but they are still positive enough to encourage the economy. Unemployment has ticked down to 7.5% which is still very high for this point in a recovery, but it is still much better than it was 18 months ago. You may rest assured that the Federal Reserve will do nothing to withdraw the stimulus to the economy as long as the unemployment rate stays in the 7.5% range. While this is bad for the people looking for jobs, it is great for stock investors. With all the talk about new taxes and other negatives for the economy, corporate earnings continue to be outstanding. It appears that the vast majority of the S&P 500 stocks are reporting that there will be a 7.8% increase in net earnings over last quarter. Further, it is anticipated that earnings will increase again in the 2nd quarter and that is in the face of huge tax increases on the average American. As I have pointed out so many times before, it is earnings that lead to higher stock prices, and as long as earnings are increasing, stock prices are likely to reflect that trend. In summary, 2013 has been great so far and I do not anticipate any major forthcoming decline. While volatility will likely rear its ugly head, I still fully expect for the stock market to be higher at the end of 2013 than it is today. With interest rates paying practically nothing and almost no alternative asset class anywhere close to giving a reasonable rate of return, in all honesty, investors would be completely naïve to invest anywhere other than the stock market. 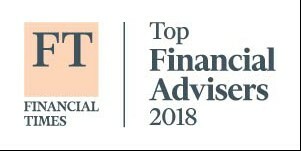 If you would like to discuss your investments or discuss adding to your investments, please feel free to call our office and set up an appointment.